The new leaders of the CIK-FIA European Championship standings after the round in Le Mans: Vidales (I - Zanardi -Parilla OK), Köhler (D-Tony Kart-Vortex KZ2), Edgar (GB - Exprit-TM OKJ) and Handsaeme (B-Exprit-Vortex Academy). Special TV report from Le Mans next week on Motorsport.tv. All is ready for the final sprint towards the CIK-FIA European titles. International karting continues to offer outstanding and spectacular races. 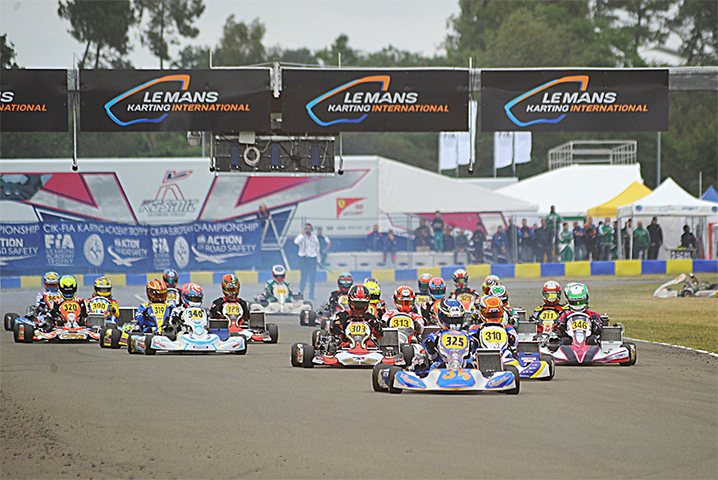 The battles for the top positions in the standings of CIK-FIA European Championships is as gripping as the show offered by teams and drivers last week in Le Mans. We are approaching the last stage of the season and every overtaking on track can be a decisive one. The next round in Alaharma (Finland) on 23rd July is the penultimate appointment for the OK and OK Junior categories, while the CIK-FIA Karting Academy Trophy will be at its last event. The following week, in Kristianstad (Sweden), the KZ, KZ2, OK and OK Junior categories will award their titles. Let’s take a look at the standings after last Sunday’s French race: it will help to make predictions about what will happen in Scandinavia. Don’t miss the TV appointments of the end of the season. WSK Promotion’s cameras are ready to offer a full media coverage of this end of season. The special report on Motorsport.tv will provide next week the highlights from the Le Mans Karting International. In chase for Vidales in OK. The OK standings changes race after race: the Spanish David Vidales (Tony Kart-Vortex-LeCont) stopped the French Theo Pourchaire’s escape attempt (Kosmic-Vortex), grabbing the head of the race in Oviedo, in his mother country. On the contrary, in Le Mans, Vidales (in the photo above) lagged behind, leaving the centre stage to Lorenzo Travisanutto (Zanardi-Parilla): the Italian driver, thanks to his flawless victory in the Department of Sarthe, gets considerably closer to the head of the standings. However, Vidales is still the leader with 45 points, despite missing the qualification to the Final in France. Pourchaire has closed the gap and he is only a point behind now. In third position, we find three drivers with 37 points: the English Clement Novalak (Tony Kart-Vortex), the Polish Karol Basz (Kosmic-Vortex) and Travisanutto, a new entry in the top-five. Köhler leaps forward in KZ2. The last lap of the KZ2 Final in Le Mans, during which the Italian Matteo Viganò (Tony Kart-Vortex-Bridgestone) was forced to pull over and to miss a certain victory, deeply affected the category standings: the Italian Paolo Ippolito (Lenzo-LKE), the winner in France, passed the former Championship leader, Viganò, and he is now second with 42 points. Second position also for the Italian Alex Irlando (Sodi-TM), who also made a big leap forward thanks to the fifth place scored last Sunday. But the real surprise is Leon Köhler (Tony Kart-Vortex, above): he hasn’t won anything in 2017 Championship so far, but the German is nevertheless the new leader of the category thanks to the results achieved in the first two rounds. Köhler, who has gathered 47 points so far, can still be easily reached in the last round in Kristianstad. Viganò, fourth with 40 points, is still among the frontrunners together with the Lithuanian Rokas Baciuska (Sodi-TM), who is currently fifth in the championship with 35 points. Edgar takes back leadership in OK Junior. The OK Junior, too, is experiencing a season full of surprises. The English Jonny Edgar (Exprit-TM-Vega, above) has taken back leadership with 61 points, thanks to the third place scored in Le Mans. Also the German O’neill Muth (Zanardi-Parilla) put in a great performance in France: he managed to gain lots of positions in the Championship standings and he is now second with 49 points. The English Harry Thompson (FA Kart-Vortex), on the other hand, was not as lucky on the circuit set in the Sarthe Department: he did not score any points in the Final and lost the leadership, dropping back to third with 45 points. Behind him, in close pursuit, we find the French Hadrien David (Zanardi-Parilla), who gained the fourth position with 43 points after the second place scored last week. The English Christopher Lulham (Tony Kart-Parilla) follows closely in fifth position with 41 points. Xavier Handsaeme is the new leader in the Academy Trophy. The Belgian Xavier Handsaeme (in the photo above) achieved a double goal in Le Mans: the victory in the Final, in fact, pushed him to the top of the Championship standings thanks to his 59 points. The Dutch Tijmen van der Helm still stands a chance to win the trophy: he is second with 46 points after the fourth place scored in France. Sami Meguetounif reached the top of the standings after scoring a podium position in Le Mans: the Frenchman is now third with 39 points. The Dutch Mike van Vugt didn’t score points and lost the leadership: his 35 points are now enough only to keep the fourth position, followed by the English Joseph Taylor with 30 (all the drivers on Exprit-Vortex-Bridgestone).